1) Create a folder on your host machine, I like to have mine on the Desktop, but you can have it wherever you want. I recommend creating a file in the folder so that you can tell if the share is working. 2) Start VirtualBox and open the settings for your Mint system. Add a “Machine Folder” and select the folder you want to share (the one you created in step 1). You will need to give it a name. Check the “Make Permanent” box so you don’t have to repeat these steps. 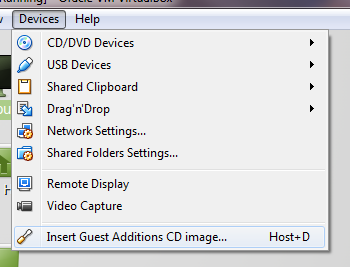 You can then check “Auto-mount” if you want VirtualBox to automatically mount the share folder. If you do this it will be mounted in /media directory, along with the prefix “sf_”. The other option is to manually set up where we want it to mount. 4) Start your virtual OS. If you want to set up the mount point yourself you will need to continue with these steps. 7) If you go to the desktop and try and open this folder (or ls Desktop/VirtualBoxShare/), it will just hang… something is wrong. From my understanding Guest Additions has not been configured for the current user. To rectify this we need to reinstall it. From the “devices” menu select “Insert Guest Additions CD image…”, this should automatically mount the CD on the desktop. If you open the mount point, it should work. 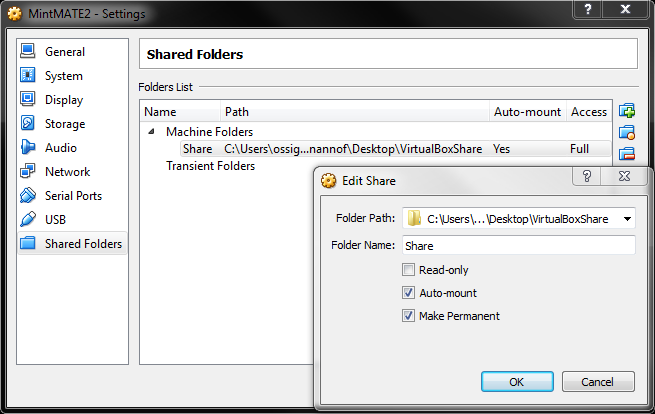 8) The next thing you probably want to do is mount the share automatically when you start Mint. If everything worked, you should now have the shared folder mounting automatically!